This week we bring you Megan Caldwell, proud owner of FIT4MOM Cedar Mill, offering amazing pre- and post-natal fitness classes in the northwest. Originally from Connecticut (we love our east coast transplants! ), Megan currently resides just outside Portland, OR. As a former educator, and now a mom to two young boys, running fitness classes for women allows her to combine three of her greatest passions: her passion for fitness, her passion for teaching and her passion for being able to spend time with my children. Megan currently offers Stroller Strides, a bootcamp style workout for moms to do with their stroller aged children, and Body Back, a results-based program without the kiddos that includes small group training, nutritional guidance and accountability, pre and post assessments and individualized goal setting. We met Megan last fall when Jessica and her daughter fell in love with her Stroller Strides classes and her overall training philosophy! I have always said that getting out for a run is my “drug of choice.” Running is one of the best medicines, and being able to share this with others has been great. I’ve had the opportunity to work with all levels of runners – from those who have literally never run, to those who have run competitively. I love that running can be a common thread between any two people, no matter what their level is, what other interests they may have, their age, etc. I also love seeing the impact that strength and conditioning can have on runner’s results, no matter what level the runner begins at. One of my favorite clients, a mom to now 3-year-old twins, used to say, “I’m not a runner,” and would casually push her kiddos behind the group. When given the tools to make herself stronger, and the encouragement to give it a shot, I’d now classify her not only as a runner, but also a sprinter. She truly rocks it, and often leads the group in running! Seeing transformations such as this is truly inspiring. Allow running to be FUN. Although this may seem like a “duh” to those who have always enjoyed running, for those who have not, it’s a great reminder. For the competitive runner (whom I used to be, and I guess still sometimes am! ), it is important realize that running is more than just a time or a pace or a result. Finding a compatible running buddy or group WILL keep running fun. I’ve learned running can be a common thread to develop lifelong friendships. Although I still love just “getting out the door” for a run, that’s harder these days with two small children. I’ve come to really enjoy both at home and group HIIT workouts (high intensity interval training). Combining spurts of cardio, strength and core, incorporating both body weight exercises and those with free weights or resistance bands, it’s been a great way to gain strength and keep fit. Not only can I get a great workout in in a half hour or less but as a runner strength training has not only helped make me a stronger, faster runner, but also assists in injury prevention. I LOVE a good smoothie! I’ve found smoothies to be a great, easy way to get some protein in after a workout, as well as sneak in some other great nutrients! My smoothies always include non-fat plain Greek yogurt and frozen fruit, either coconut water or low fat milk and a handful of leafy greens (either spinach or kale usually). I then like to switch it up, sometimes adding in oatmeal, chia seeds, avocado, you name it, I’ve probably given it a shot! If I’ve been out on an exceptionally long run or completed a tough workout I may throw in a scoop of protein powder. If you were to ask my parents, they’d probably say I began running around the age of one, and haven’t stopped! As an avid soccer player and basketball player from a young age, I joined track in middle school merely as a means to stay in shape for my team sports. Fast forward a few years, after a successful high school career as a three-sport athlete, I went on to compete in soccer and track in college. Primarily as a sprinter and jumper, after one season of collegiate soccer, I decided to focus my energies on track and field where I competed four years at Tufts University in Boston as a heptathlete (think decathlon, but for women.) College track is really where I think I found my love for running. Post college I decided to give long distance running a shot (something I swore I’d never do!) Over the past 10 years I’ve run two full marathons, a few halfs and many, many 5ks and 10ks. 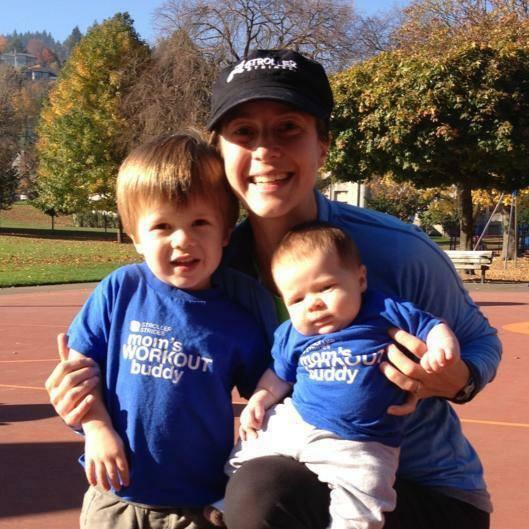 I’m looking forward to my first race post-baby #2 – Portland’s famous Shamrock run in March!